Frequently contracted by museums around the world to restore a variety of artifacts, the Cosmosphere is proud to have restored flown U.S. spacecraft that are part of the collection of the Smithsonian Institution’s National Air and Space Museum. 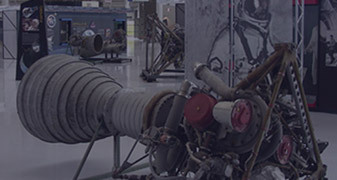 Museums frequently contact the Cosmosphere for exhibit production and artifact restoration and replication. -General John Dailey, Director of The Smithsonian Institution’s National Air and Space Museum. 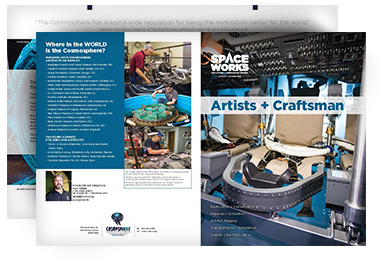 Since 1988, the team at SpaceWorks, a division of the Cosmosphere, has brought the highest standards of craftsmanship to artifact restoration, conservation, high fidelity replicas and more. Because of the team’s extensive experience in conservation work, SpaceWorks clients are assured that exhibits are handled with the utmost care and highest professional quality. 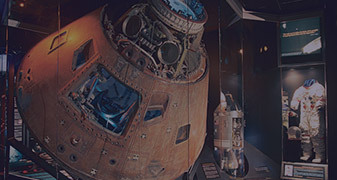 In addition, SpaceWorks has created custom display cases for artifacts in the galleries at the Cosmosphere as well as other museums and touring exhibits around the world. That same quality comes to the installation of exhibits. From restoration to conservation, SpaceWorks provides unparalleled experience and commitment to the highest standards in the museum industry. Tell us about your next project. Chances are, we can help!